What parents have to say about C.R.C.C. This school is exactly what I was searching for and more! The school is like a home away from home for the children. Each classroom looks like a living room in a child’s dream imaginary play house. There are plenty of cushioned chairs and seating, block areas, books, stuffed toys, a costume area, lots of shiny sparkly things to touch and play with. It’s a place where your child is free to BE! My son has gone there for 3 years and we are so grateful for the outstanding teachers. In the 3year old class- Caterpillars, he had Ms. Milligan and Ms. Prough, who he loved! Ms. Milligan has 2 kids of her own, so she KNOWS how to care for your kids with love and understanding. Ms. Prough is terrific and I probably shouldn’t say this, but she is on high demand outside of school as a sitter for lucky parents at the school! She’s that wonderful! Now that he’s in the Butterfly -pre-K class, he has Ms. Mathiasen, Ms. Rettig and Ms. O’Keefe, two of whom have kids of their own as well. Ms. Mathiasen has many years of experience and every year leads the Kindergarten Readiness meeting for the parents at the school. She knows what skills, both academic and social, the kids will need to learn to do well in school. Her curriculum is wrapped around studying different artists and experimenting with different artistic mediums, all the while teaching children how to express themselves, organize their thoughts, and reach for their dreams. They do many pre-writing exercises and work on the alphabet and writing their names, but without rigid mindless repetitive drills and worksheets you might find at other schools. The principal (Director), Trice Barr, is always readily accessible by phone or email and is an excellent support to her staff and parents. Even if you don’t necessarily need full day-care hours, this is a school that you should look into. However, they do charge based on the days, not hours attended. The school is located on the Navajo Canyon/Adobe Falls Hiking Trail that provides an excellent opportunity for exploration. The children take several hikes throughout the year. The school also has many special event days to mix it up for the kids. They put on an adorable Halloween Parade, and have frequent Bike Days as well. Call to schedule a tour! You won’t be disappointed! “Choosing a preschool is no easy task for any parent. For this parent it is especially difficult as I have been in the early childhood education field for over 20 years. Before choosing our school I checked with colleagues and did my homework (that you must do as well) ~ I asked about staff (education and longevity) and developmentally appropriate practices. I made observations and visited unannounced. Then we chose Canyon Rim. You can go to their website to get all of the information about the philosophy and all… I can share that I feel that they hold themselves true to what you will read. As an early childhood professional I could go on and on with the early childhood “lingo” but I won’t. My review is parent to parent. Canyon Rim is a nurturing and loving place that will stimulate your child’s creativity. I can share that we found Canyon Rim to be all about respect. They really spent a great deal of time getting to know our child as a unique individual and they provided activities that met his needs and interests. Without fail, he was greeted every day. When he needed encouragement to find a friend, they helped him. When he needed to shine, they sent home the “mystery backpack” (where he chose something special from home, brought it to school in the special backpack and described the item to his class). Canyon Rim became an extension of our family. There is a wonderful sense of inclusion at the school that has been created by the teacher’s amazing communication and attentiveness to everyone. Respect for the world around us. I observed teachers explain to children why we should let flowers bloom, and why the sand needs to stay in the sand box. I also observed them asking children open-ended questions ~ allowing children to come up with their own conclusions and often encouraging them to experiment with their notion. I only wish there were more classes available at CRCC—our little guy Levi will be graduating next year! Received in an email 10/28/14 from Dave R.
This is a magical place for kids! My son absolutely jumped right in and has been so well cared for. The teachers also make a point to know the parents well, and I feel so fortunate to have discovered this wonderful preschool! Lots of outdoor space, physical activity, art, and playtime. I am interested in an a nonacademic environment and this is perfect. I have three kids and due to moves, we’ve been in five preschools over the years. This one is awesome. Posted on Facebook by Chris F.
Posted on Facebook by Joanne W.
Posted on Facebook by Marilyn O.
I just thought all the teachers and staff at Canyon Rim (both present and past) should get a little kudos today for a job well done! Two of your alumni students from 2007 are now in the 5th grade at Marvin Elementary, both ran for student council and both won. I think it serves as a reminder that the education, confidence and love that you give these children on a daily basis has a lasting effect. Posted on Facebook by Jennifer B. R.
We waited forever to get in and our son loves it there! He started in the two year old class and the love of the teachers and structure really made the transition easy. He is now in the three year class and learns so many new things each day. The school is tucked away in a quiet neighborhood against a canyon, we feel safe and our boy is happy. I just wish they had an infant program for baby #2 on the way! We enrolled our first child at Canyon Rim Children’s Center (CRCC) in 2001 and our second child in 2006. If we have a third he/she will also be a “Canyon Rim Kid“. CRCC is full time enrichment preschool where the children are truly treated as individuals. The director and all of the teachers live their motto “Dedicated to the individuality of children“every day. If you are looking for a preschool with a program that will prepare your child for kindergarten and beyond, I suggest you check out CRCC. Start with their web site and then schedule a visit. You will NOT be sorry that you did. 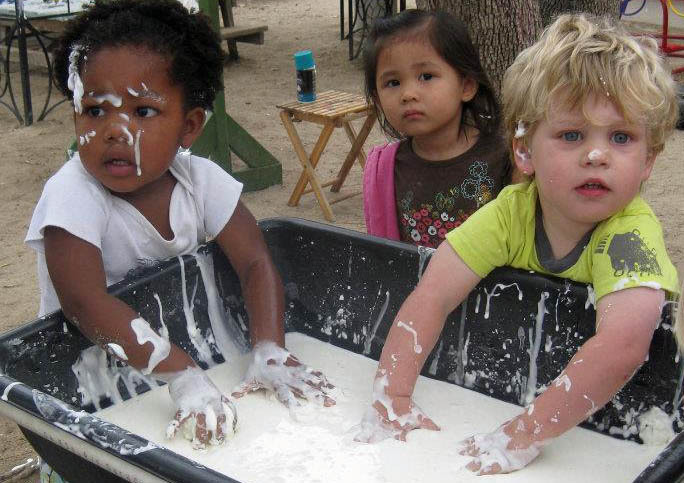 We highly recommend Canyon Rim Children’s Center to anyone seeking a first class preschool. The staff is well trained, they require their lead teachers to have college degrees in addition to early childhood certification. The grounds are beautiful and the staff is caring and responsive. If you are a parent of a CRCC child and would like to add your opinion or if you have read a recent review about us that we do not have published here please let us know, You can send us an email with your comments to: info@canyonrimcc.com. This is how parents have rated our teachers. Source: The Savvy Source parent to parent web site. For more information and parent rankings: Click Here.